South Sudan is the world’s youngest state. Its independence in 2011, following the 2005 Comprehensive Peace Agreement with Sudan, ended the longest civil war in Africa. Subsequently, the Sudan People’s Liberation Movement (SPLM), a coalition that had been established to fight for the independence became the basis for the government of newly founded South Sudan. SPLM, like many other coalitions bound together by a fight for common cause (in this case the independence), started to eventually unravel. Even after the independence, everyday life in South Sudan has continued to be characterised by insecurity and inter- and intra-communal violence. In a country, which is inhabited by variety of ethnic groups, which are further fragmented into tribes and communities and with a history of fighting each other, creating a lasting peace is an effort that will take years. The current crisis has its origins much further than mid-December when the violence broke out. The tensions between South Sudan’s president Salva Kiir and his deputy Riek Machar fully came to light when the latter was fired along with about half the cabinet in last July. This cabinet reshuffle has been interpreted as an attempt by President Kiir to consolidate his power and get rid of his closest rival, Machar. The political competition between them escalated on 15 December, when President Kiir accused Machar and several other former high level politicians of plotting a coup. Eleven of the accused coup plotters were arrested while Machar managed to avoid arrest. After six weeks of armed conflict, continued efforts by regional and international actors such as the Intergovernmental Authority on Development (IGAD), the United Nations, the United States and Norway finally led to the signing of a ceasefire on 23January. IGAD currently led by Ethiopia has been the main mediator, and IGAD-led negotiations are scheduled to resume in Addis Ababa on 7 February. The European Union has provided support for the IGAD mediation effort in the form of financial support of 1,44 million euros and has continued to provide humanitarian aid to address the worsening situation. The humanitarian situation was bad even prior to the current clashes which have, according to some estimates, resulted in over 10,000 deaths. Latest UN figures put the number of internally displaced people to over 700,000 with more than 100,000 having fled to neighbouring countries. The release of seven out of eleven detainees accused of attempted coup and held by the government since December is a promising sign for the negotiations, but for lasting peace to be possible in South Sudan several issues need to be addressed. Of such issues, the fate of remaining four detainees is not most significant, instead national reconciliation should be a top priority. 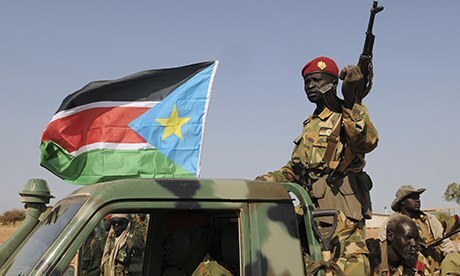 Before the current escalation, it seems that international actors focused more on the tensions between South Sudan and Sudan and failed to take the necessary actions to prevent the escalation of tensions within South Sudan. The conflict is not a straightforward clash of different ethnic groups, even though majority of attacks have been between two of the largest ethnic groups in South Sudan, the Dinka and the Nuer. For instance, on one hand, many of the senior figures in Kiir’s government are Nuer and on the other hand, some of the most high profile supporters of Machar are Dinkas. The divide is often on tribal lines instead of ethnic ones. There is a tendency in South Sudan for people to favour individuals from their own tribe, and this creates tensions in the society. Furthermore, several rebel groups have existed and fought against the government even before the current clashes. There are several long-standing insurgencies that continue to destabilise the country. For instance, a rebel group, the South Sudan Democratic Movement (SSDM) led by David Yau Yau, has clashed against the government in the Jonglei state since 2010 when Yau Yau failed to win a seat in state assembly. Significantly for the current negotiations and attempts to create stability, SSDM signed a separate peace agreement with the government. The viability of the ceasefire has been questioned by continued reports of clashes and violence on both sides. The advance team of unarmed monitors arrived in Juba last Sunday and they are expected to deploy to flashpoint towns of Malakal and Bentiu in the north of the country near the main oilfields and to the capital of Jonglei state, Bor, which has seen the most violent clashes. However, their ability to cooperate with UN troops present in the country to control the possible outbreak of violence is questionable and, thus, there is a need for the talks to resume as planned. This entry was posted on 03/02/2014 by ISIS Europe in Behind the headlines, Contributors, Saara Ilmonen and tagged ceasefire, Ethiopia, ethnic tensions, EU, Humanitarian Aid, IGAD, Mediation, Peace negotiations, South Sudan, SPLM, Sudan, United Nations, US.